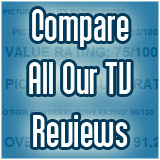 We chose the below televisions for your home office based on dual use functionality. All of the below TVs function just as well as a PC monitor as they do as a television. Various sizes are recommended from a 22" for your desktop to a 46" that can be used for presentations or for keeping up with the news or the game while you're working. Samsung's 2011 4 Series LCDs are a step up from the 3 series. Available in the same sizes they still feature a 60Hz, 720p, CFL backlit panel, with SRS TruSurround HD. They add a third HDMI input, the ability to watch video off a USB thumb drive and Samsung's AnyNet+ which allows communication between similarly equipped Samsung home theater equipment. You'll be surprised at the big, bold colors that this 26" LCD HDTV delivers. Its images are lifelike and crystal clear. The picture quality is sharp. And action scenes look like they should--with smooth motion. The classic black bezel also has a new twist--the bottom bezel and neck are transparent, creating a more modern look. Enjoy your favorite movies and TV shows in bright, vivid color with this SAMSUNG LCD HTDV. The UN32D6000 presents an interesting spectacle in the 32-inch market. It will not be the most price competitive TV but will offer a superb picture for HD programming for those wanting a very sleek small TV. The D6000 represents a mid tier unit in Samsung's lineup but the 32D6000 is one of the top tier Samsung 32" TVs available.